Mix together Montmorency tart cherries, dates and garlic in a small sauce pan on low; heat until dates are rehydrated. Meanwhile, boil orzo pasta in salted water for 8 to 10 minutes. Drain pasta, stir in tart cherry mixture and feta cheese. Season with salt and garnish with fresh basil. Rinse chicken; pat dry with paper towels. Pour milk into a shallow container. Combine flour, thyme, salt and pepper. Dip chicken first in milk, then in flour mixture; coat evenly. Heat oil in a large skillet. Add chicken; brown on all sides. Put chicken in a 13x9x2-inch baking dish. Bake covered with aluminum foil, in a preheated 350 degree F oven for 30 minutes. Meanwhile, drain Montmorency tart cherries, reserving 1/2-cup of Montmorency tart cherry juice. Combine Montmorency tart cherry juice, brown sugar and granulated sugar in a small saucepan; mix well. Bring mixture to a boil over medium heat. Add mustard; mix well. Cook 5 minutes, or until sauce is slightly thickened. Stir in Montmorency tart cherries. After chicken has cooked 30 minutes, remove from oven and uncover. Spoon hot tart cherry mixture over chicken. Bake, uncovered, 15 to 20 minutes, or until chicken is tender. Serve immediately. Heat oil in a large skillet on high heat. Add pork chops; brown well, about 3 minutes per side. Remove to plate. Add onions to skillet; cook until tender, 3 to 5 minutes. Add chicken broth, dried Montmorency tart cherries, orange marmalade, vinegar and red pepper flakes. Bring to a boil; boil rapidly on medium heat until broth is reduced by half. Reduce heat. Add pork chops to pan to heat through, 5 to 6 minutes. (Cook pork chops longer on lower heat if pork chops are very thick or have a bone in them.) Internal temperature of the pork should be about 160 degrees F.
Add chicken broth or water, if needed. Serve pork chops with cherry sauce spooned over them. Line bottom and sides of an 8 x 8 x 2-inch baking pan with foil. Spray the foil lightly with nonstick spray. Set aside. 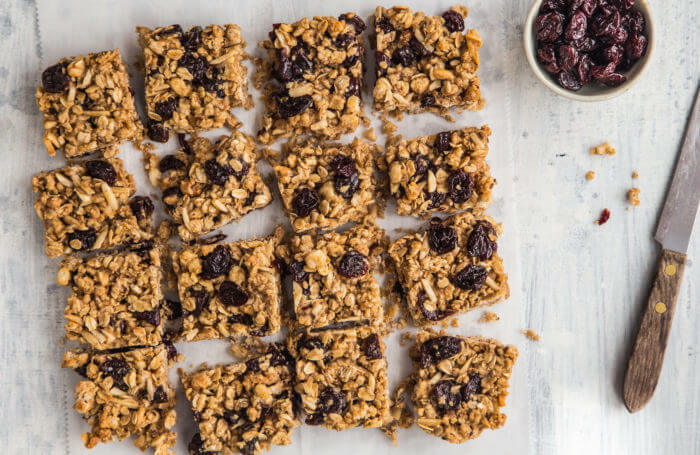 Combine dried Montmorency tart cherries, granola, oats, flour, almonds and cinnamon in a large mixing bowl. Stir together egg whites, honey, brown sugar and oil. Add to granola mixture, stirring until all is coated. Press mixture evenly into the prepared pan. Bake for 20 to 25 minutes, or until bars are light brown. Let cool completely (about 10 minutes) on a wire rack. Use foil to remove from pan. Cut into bars. Place the almonds in the bowl of a food processor and process until fully chopped. Add ½ cup dried cherries, 12 Medjool dates, 1 tablespoon cocoa powder, ½ teaspoon vanilla extract and 1 pinch kosher salt. Process until smooth. Add the remaining ¼ cup cherries and cacao nibs and gently pulse a few times to incorporate. Turn out the mixture onto a baking sheet and press it into a flat layer of the desired thickness. Roll a rolling pin over the top to smooth it to a uniform thickness. Place the baking sheet in the freezer or refrigerator for 30 minutes to harden, then slice into bars of the desired size. Store in a sealed container in the pantry or refrigerator. Opt for a cherry pop for a refreshing warm-weather treat. Makes 5 to 6 frozen pops. Stir together yogurt, cherries, juice and honey in small bowl. For easier chopping, chop cherries while still frozen. Spoon yogurt mixture into 2-ounce freezer pop molds and insert handles. (If using paper cups, spoon mixture into cups and cover each with foil. Cut a small hole in center of each foil top and insert a pop stick.) Freeze about 6 hours or until firm. Per serving: 76 calories, 1 g total fat, 1 g saturated fat, 0 g trans fat, 15 g carbohydrate, 4 mg cholesterol, 2 g protein, 0 g fiber, 31 mg sodium; Daily Values: 6% vitamin A, 0% vitamin C, 8% calcium, 0% iron. In a blender, puree half the frozen pitted dark sweet cherries, half the frozen strawberries and half the cran-cherry juice, stirring as needed, until smooth. Pour into two serving glasses. Repeat with remaining ingredients for two more servings. Combine flour, brown sugar, baking powder, salt, oil, eggs and vanilla; mix on low speed of electric mixer until blended. Mix 1 minute on medium speed. Batter will be thick. Spread half of batter in oiled and floured 9-inch baking pan. 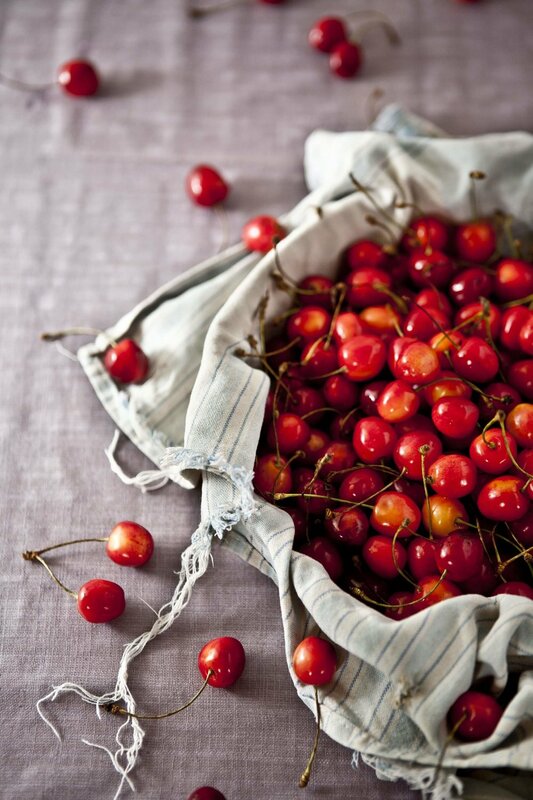 Toss cherries in small amount of flour. Scatter cherries over batter; spread remaining batter over cherries. Bake for 30 to 35 minutes or until wooden pick inserted near center comes out clean. Cool on rack and cut into 16 pieces. Chocolate Chip Variation: Sprinkle 1/2 cup chocolate chips over batter with pecans. Per Serving: 207 Calories, 2.2 g protein, 28.2 g carbohydrate, 9.9 g fat (42% Cal. from fat), 27 mg cholesterol, 0.6 g fiber, 88 mg sodium. Thumbprint cookies are just what the name implies, a cookie with a thumbprint in the middle which is filled will delicious homemade cherry filling. Preheat oven to 350◦ F.
For jam: Combine cherries and water in a small pot and simmer over low heat until fruit is tender, about 10 minutes. Add lemon juice, zest, and sugar and stir gently until sugar dissolves. Bring to a boil and boil rapidly for 10 minutes, stirring on occasion, until thick and syrupy. Pour into a shallow bowl and cool, or alternately refrigerate until jam is set. This can be made a day ahead. For cookies: Beat butter and sugar with an electric mixer until creamy. Beat in egg and vanilla or almond extract. Add flour and mix until just combined. Form dough into 1-inch balls and arrange on an ungreased cookie sheet. Using your thumb, make an impression in the center of each ball. Fill each cookie with cherry jam making sure each has a cherry in the center. Bake for 12-15 minutes, until the dough is set and lightly browned on bottom. Remove from pan and cool on a wire rack. Note: For more uniform cookies, refrigerate the dough for 30 minutes before forming into balls. Combine water and sugar in small saucepan; add halved cherries. Bring mixture to boil; reduce heat and simmer 5 minutes. 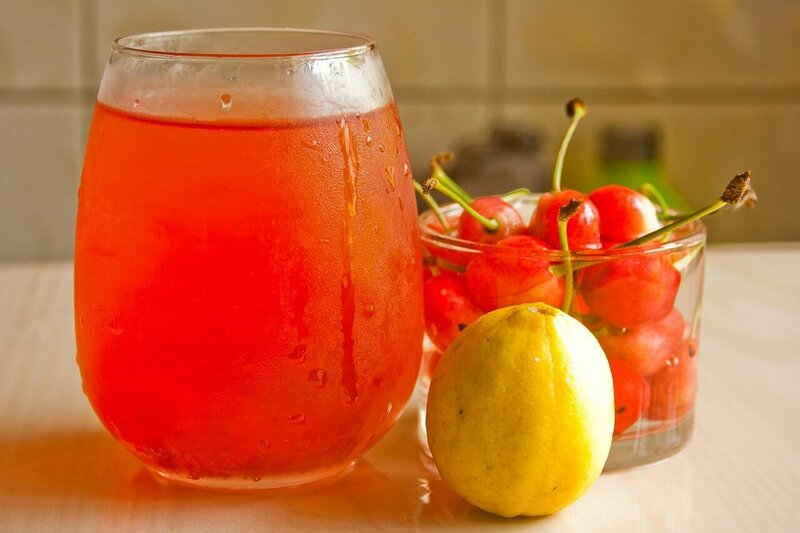 Strain syrup into container with tight fitting lid; discard cherries. Fill a tall 12 to 16-ounce glass with ice. Pour 1/4 cup lemon juice and 1/3 cup syrup over ice and top with club soda. Garnish with cherries and mint. Makes 4 servings. Tip: Leftover syrup may be stored, refrigerated, up to one week. Per Serving: 140 Cal., 0 g pro., 0 g fat, 37 g carb., 0 mg chol., 1 g fiber, 28 mg sodium.